You are here: Home / General / Wanna earn some money? 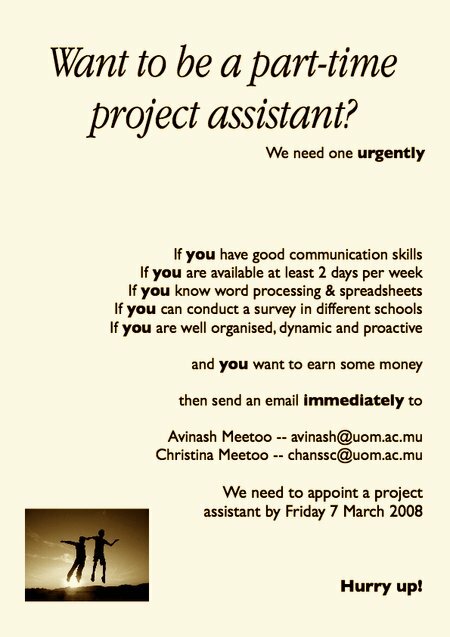 We need someone urgently so if you are interested and feel you can do it, send us an e-mail fast! No posts on the latests PM “advices” to the media?? No posts on the latest PM “advices” to the media?? You are right. I should have! There are so many things I should have posted about the last few weeks but I just could not find the time. I have been terribly hectic. A comment anyway: I hope they realise now this whole stupid event has backfired on them. And this proves one thing at least: there will be no end to stupidity. This can be fatal in Mauritius when combined with inflated egos….